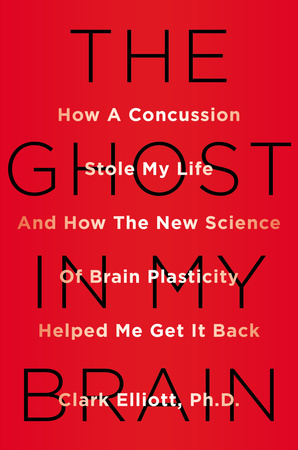 "Return to Learn: A Guide to Visual Recovery after Concussion"
"New Treatments for Concussion Based on Recent Brain Research"
An ABI can be from an external traumatic injury (where the brain encountered physical trauma from such incidents as a motor vehicle or bicycle accident, a fall, an assault, contact sports, or neuro-surgery, etc.) or it can be from an internal cause (a stroke, an aneurysm, a brain tumor, a viral infection or inflammation such as meningitis, a vestibular dysfunction such as Ménière’s disease, or any post-surgical complications leading to an anoxic or hypoxic event in the brain). Sensitivity to light, sound, etc. 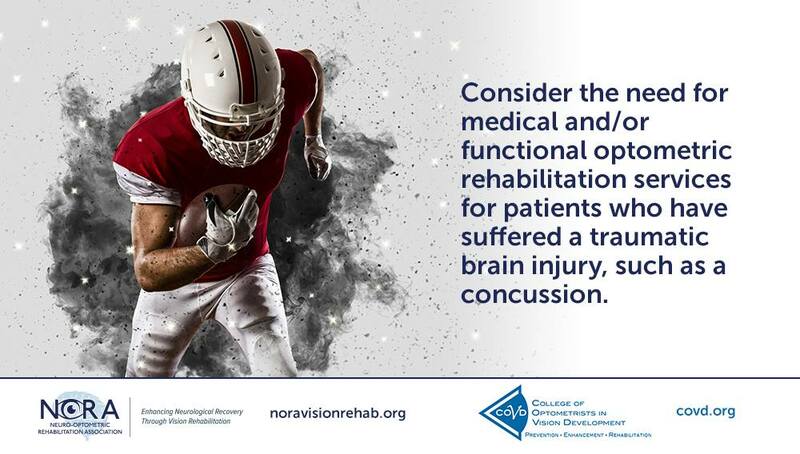 The signs and symptoms of mTBI/concussion may be experienced immediately, but they also may be delayed by hours, days, or even weeks after the injury. It can also include symptoms similar to that of a concussion including ringing in the ears, tiredness/fatigue, dizziness, mood changes, sleep disturbances, and difficulty with memory and concentration. An optometrist who has specific interest in diagnosing and managing problems with binocular vision and provides vision rehabilitation in the form of special glasses (that include a specific prescription, prisms, tints, and/or coatings) or in the form of in-office or out-of-office visual rehabilitation. When scheduling an eye examination, ask if the optometrist provides evaluation services for binocular vision problems and neuro-optometric rehabilitation. Lens---a specifically prescribed optical device that focuses light onto the retina to obtain a clear image; at times, lenses are used at near to help the eye focus more easily and efficiently with increased comfort. Prism---a specialized optical device that deviates/'bends' light; prisms are frequently prescribed as a component of the treatment for binocular vision problems and to eliminate double vision, as well as to provide comfort for near visual tasks such as reading. Tint/coating---an optical component that alters the amount of light to the eyes; at times, it may also alter the color of the object; they are used to help those with light sensitivity/glare problems. Selective occlusion---the use of specially graded filters to help patients who are experiencing double vision or visual confusion. ----a series/sequence of scientifically-proven, brain-based, sensory-motor-perceptual procedures and techniques that remediate visual dysfunctions/deficits, which improves one's visual efficiency and visual comfort. Neuro-Optometric Rehabilitation (NOR) represents a specialized area of optometry, which addresses the oculomotor, accommodative, visuomotor, binocular, vestibular, perceptual/visual information processing, and specific ocular/neurological sequelae of the acquired brain injury population. 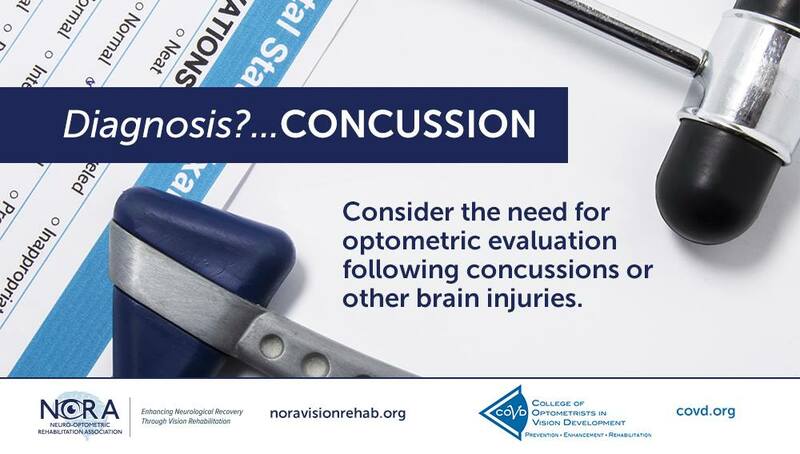 This includes the diagnoses of concussion, traumatic brain injury, cerebrovascular accident/stroke, post-surgical brain complications, encephalopathy, vestibular dysfunction, and neurological conditions adversely affecting the visual system. NOR includes standard optometric modalities, such as corrective lenses, prisms, tints and coatings, selective occlusion, and optometric vision therapy. Optometric vision therapy incorporates both in-office and out-of-office procedures for the remediation and management of the associated visual problems listed above with the goal to improve activities of daily visual living and performance. Optometric vision therapy is based on sound principles of neuroscience involving visual motor and perceptual learning reflective of the underlying visual/neural system plasticity. It frequently is provided in conjunction with other rehabilitation and health care professionals. Typically, early intervention is more beneficial, but it’s never too late to seek rehabilitation after a brain injury. 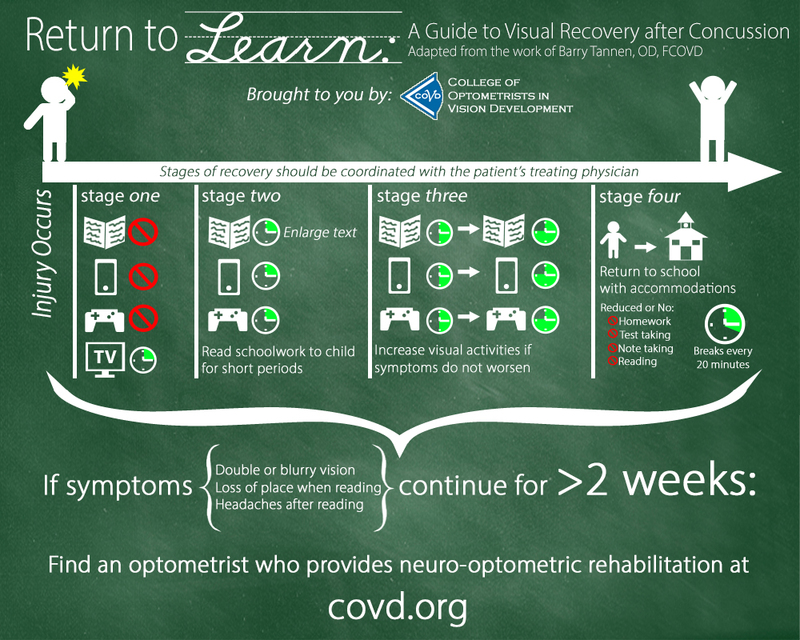 If you or someone you know is having visual problems from an acquired brain injury, we are here to help.